The second part of Zhang Jizhong’s adaptation of Jin Yong’s Condor Trilogy, which was proceeded by Legend of the Condor Heroes (2003) and followed by The Heaven Sword and Dragon Saber (2009). The trilogy remains one of my favorites just because of the sheer size and history as we get to see three generations of our favorite heroes! Return of the Condor Heroes is one of Jin Yong’s most popular tales and has been made into three films and eight different T.V. series from 1976 to the current series released in 2014. The 2001 version was an animation made in Japan. The 2006 version has 41 episodes at 45 minutes each. I was lucky that a friend found me the DVD box set when he went to Singapore on holiday. The story is about Yang Guo, the son of Yang Kang and Mu Nianci from Legend of the Condor Heroes. Yang Guo is orphaned and is passed from one place to the next before finding Xiao Long Nu who becomes his master and eventually his lover. Guo Jing and Huang Rong also appear in The Return of the Condor Heroes, although obviously played by different actors as it takes place more than 18 years after the events of Legend of the Condor Heroes. Although for me no one could play Huang Rong better than Zhou Xun. This story is heavy on the Romance as we deal with poor Yang Guo and Xiao Long Nu who are rejected by society for their love for each other. It is taboo for a Master and apprentice to be intimately involved. We deal with their separation and reunion over and over as well as Yang Guo’s journey to be called the Condor Hero. The show really is very good, although at times I wish there was less romance and drama involving the two lovers. Still I really loved to see how the story progressed from the Legend of the Condor Heroes as I’ve yet to find a good translation of the trilogy. Huang Xiaoming (Ip Man 2, The Banquet, The White Haired Witch of Lunar Kingdom) as Yang Guo. This was the first time I saw Huang Xiaoming in anything and I thought he did a good job and his career and his acting skill has certainly improved over the years. Liu Yifei (Demi-Gods and Semi-Devils, Chinese Paladin, White Vengeance, The Four) as Xiaolongnü. Her costume was amazing and she looks just like Jin Yong described her character! Liu Yifei seems to be in everything these day. It would be nice to watch her in something that would challenge her acting abilities. 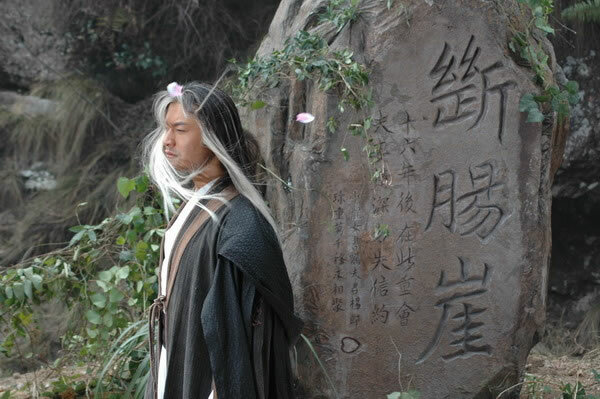 Zhao Liang reprises his role as Zhou Botong having played him in Legend of the Condor Heroes. He really does well playing the Old Imp and it helped giving the story continuity with the previous series. Guo Jing and Huang Rong are back but now played by Wang Luoyong and Kong Lin. I’ve not seen these two in anything else other than this series. I want to complain about the amount of time they spend on the love story but in all fairness that is how the original novel is written as far as I’ve been able to tell. It is, overall, fun to watch even if it gets a bit tedious in some areas and I really like what Zhang Jizhong has done with the trilogy. The costumes are really nice to look at and the sets and scenery were made and selected with care. The camera work is especially different than it was for Legends of a Condor Hero which I like as this is about a different couple, it gave it a more dreamy atmosphere. There are so many characters, clans, schools to remember in this series that I find myself taking notes or double checking things on wikipedia. Overall I prefer Legends over Return of the Condor Heroes. As usual I don’t get too much into the full story details but I have added links below for those of you that just love a spoiler. Wuxia Edge Review, a really great site! This entry was posted in Romance, Wuxia and tagged Huang Xiaoming, Jin Yong, Liu Yifei, Romance, Wuxia. Bookmark the permalink.